Honor launched their new gaming-centric smartphone, the Honor Play in India. It was first launched in June in China along with Huawei’s GPU Turbo technology. The smartphone is Amazon exclusive and is priced at Rs 19,999 for 4GB RAM version and Rs 23,999 for 6GB RAM verspion. The key feature of the phone includes the Kirin 970 flagship chipset and an immersive 19.5:9 display. To enhance the gaming experience, Honor has introduced their GPU Turbo technology that is said to increase the performance by 60% while reducing battery consumption by up to 30%. There’s also an AI-based shopping experience called Hi Touch, which lets users take photographs of products to look and buy them via Amazon. The Honor Play runs Android 8.1 Oreo with Huawei’s own EMUI 8.2 on top. As mentioned, it has the company’s high-end chipset Kirin 970, with either 4GB or 6GB of RAM. The phone has a dual camera setup on the back, consisting of a 16MP primary sensor with f/2.2 aperture and a 2MP secondary camera with f/2.4 aperture. On the front, it has a 16Mp sensor with an f/2.0 aperture. The dual-SIM phone also offers support for microSD card for storage expansion up to 256GB via hybrid slot. In this price range, there’s hardly any competition lying in front. Most phones like Redmi Note 5 Pro, and Asus Zenfone Max Pro M1 are comparatively cheaper than this. The closest in terms of price is its own sibling Huawei P20 Lite and Nova 3i. It will go on sale from today onwards on Amazon India website and HiHonorStore. It will be available in Midnight Black and Navy Blue colour options. 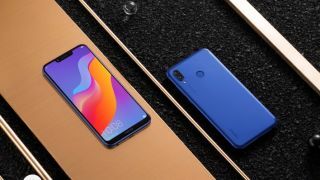 The Honor Play launch offers on Amazon India include a bundled Vodafone offer that will provide 10GB of data additional per month for a year, along with an Amazon Prime subscription, and more.